Halter dresses have always been a favorite of mine because of their vintage influence. There’s just something fun about a halter dress in the summer, like roller coasters and kettle corn, so when Tie Dye Diva Patterns began updating their Sweet Summer Halter Dress pattern, I had some fun helping out! How could I say no? 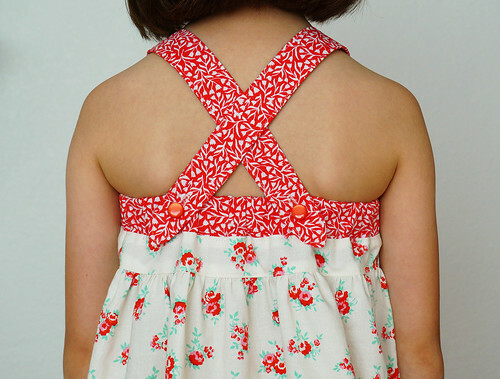 The overall dress pattern has been refitted and drafted with lots of new options, including a cross back feature that is absolutely adorable! I actually love that it can be both a halter and cross back if you choose. The buttons aren’t sewn on yet in the above picture since we were still testing fit, but they can be added so easily that even if you chose the halter version first, you could always add the cross back option later. 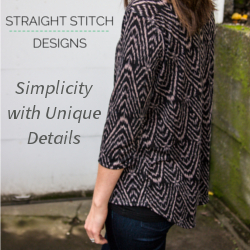 This is an earlier version of the strap length so just a bit shorter than the final pattern’s version. It’s still comfortable on her though, and she’s worn it several times which makes me happy because I love this sweet fabric! It’s by Elea Lutz for Penny Rose Fabrics, and it’s one of the prints from the Milk, Sugar, and Flowers collection (not the red accent fabric, that’s from JoAnn’s) which takes its inspiration from the 30’s. 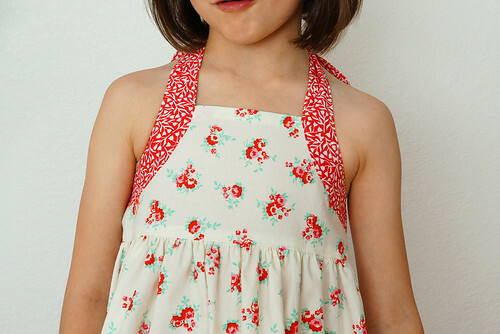 Ok, the Solana Dress (*afflink) pattern’s details: the size range includes 12 months to 9/10 years (and layers so you can just print what you want), provides knee or maxi lengths, regular hem or contrast band or ruffle, and inseam pockets which do not distract from the lovely lines of this dress, but hey, what girl doesn’t want pockets to stuff things in?! This is also such a fast and satisfying sew, especially because the bodice is unlined. 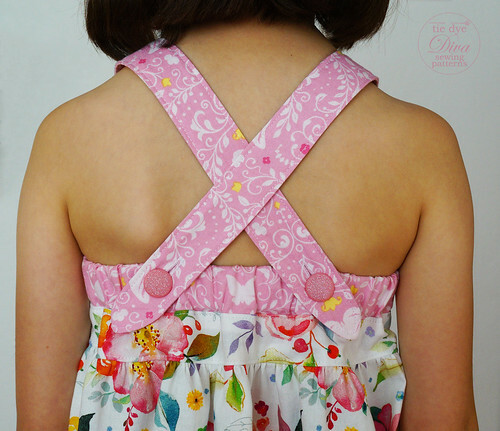 For the cross back option, we like the straps outside to show off those cute little buttons and strap points, but you can also have them button on the inside if you like. Here it is as a halter with buttons attached. This dress is so perfect for those hot summer days! The halter looks super adorable with a cardigan too, or a denim jacket and cowgirl boots. 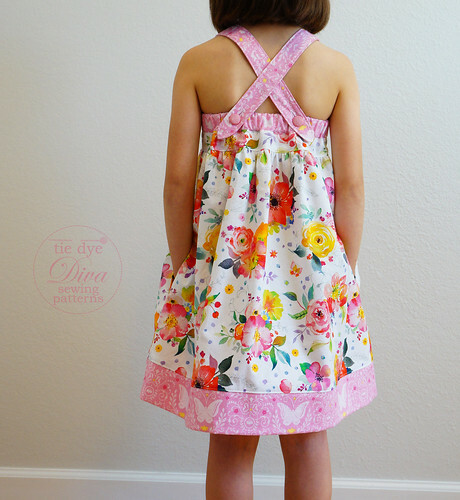 It can be dressed up so many different ways, and depending on the fabric and trim, this dress can really be dolled up! Especially with the maxi and ruffle, next on my list… If you’re curious about this brilliant floral fabric collection, it’s Brenda Walton’s Chelsea Market collection for Blend Fabrics. The pictures just don’t do this fabric justice. In person it’s amazingly gorgeous, with sweet little butterflies lurking about the flowers. 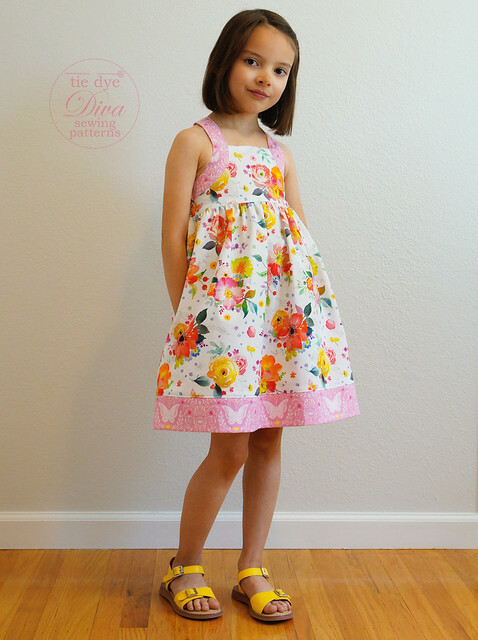 The Solana Dress (*afflink) is currently on sale with its re-release, and if you had already purchased the Sweet Summer Halter Dress, Tie Dye Diva Patterns is giving an even deeper discount on this upgraded version with additional options, just fill out this form for the coupon code. So who’s excited for summer now?! I really love the pattern, but I can’t seem to find the main fabric, Yorkshire Blooms Ivory, any place on the web!!! Any ideas?? ?